Fast sweeping section that is really satisfying if you get it right. 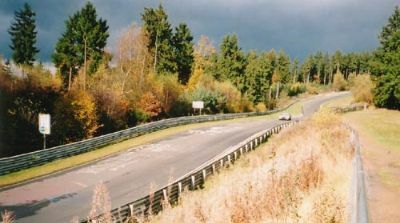 added pressure to do so because there are almost always peoplewatching the circuit action here, due to the proximity of a main road, the 412. Over the blind crest right hander and into Eschbach corner. Reverse shot looking up as Eschbach exits into Brunnchen. 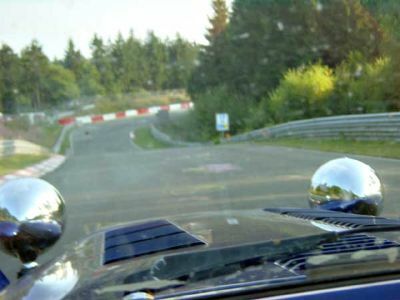 As you round Eschbach the huge car park overlooking Brunnchen opens out in front of you. 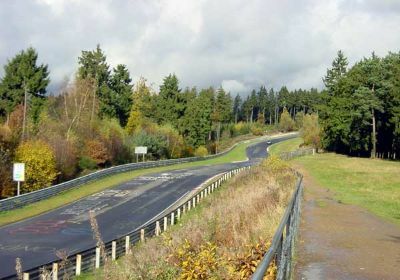 The main road passes along the back of the car park. 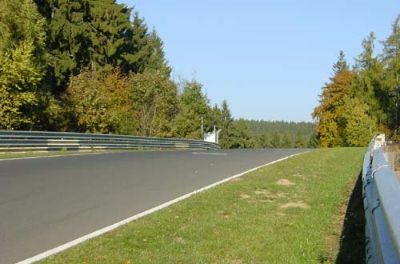 Car view of the same corner. The track dives around to the right in a sweeping 'S' - watch this not the people! Even in the depths of winter the locals pop out here to eat their lunch and see what is on the track that day. ...and onto this short straight, before a hard but fast right up into the trees - often in the shadows (and therefore damp) as seen here. Here we are descending into Brunnchen, in a picture taken by one of the Mini chaps - cheers guys! Note the damp track, but front left wheel is decently tucked up under the wing as we corner hard!! 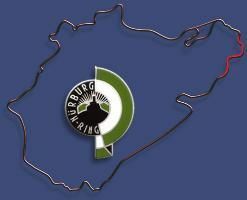 Exiting Brunnchen. 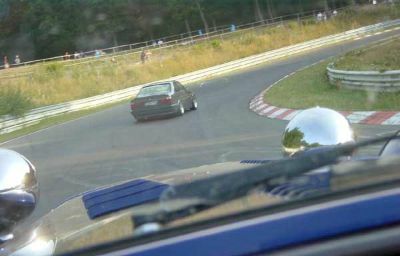 This was on our first visit (as are all the in-car pictures in this Nurburgring section) and we have just pulled over to the right out of the way of this stripped out local 5 Series, which was also on slicks. Reverse picture taken from the spectator area, which you can see in front of us in the picture from our car above. 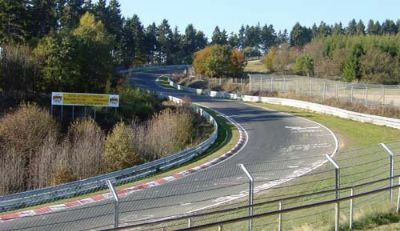 This shows the size of the Brunnchen section.the black line also clearly show the line through these corners, as it does around most of the track. 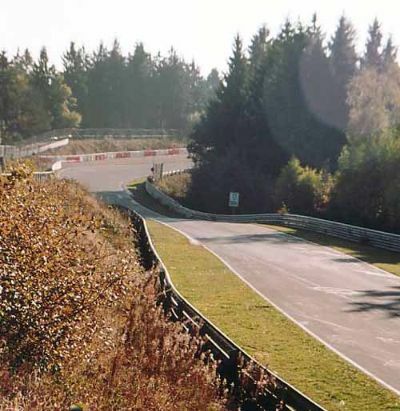 Just don't follow the smaller, thinner double black lines that occasionally spear off the track towards a nice shiny new piece of Armco! 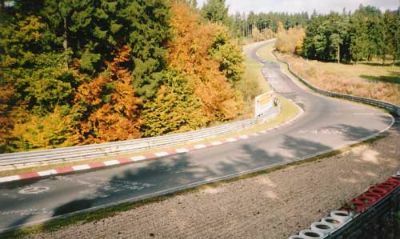 Looking left from the picture above the track turns through the trees and away towards a left-right sweep, Eis Kurve, into Pflanzgarten 1 around the corner. 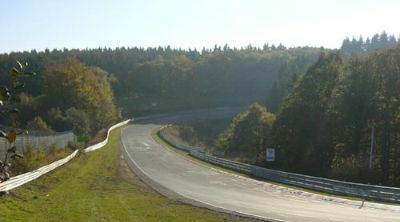 Eis Kurve means 'Ice curve' and is so named for a reason. The shading from the trees here means that if it is cold or wet, this will probably be the last place to either thaw or dry. ...round a long sweeping left kink. 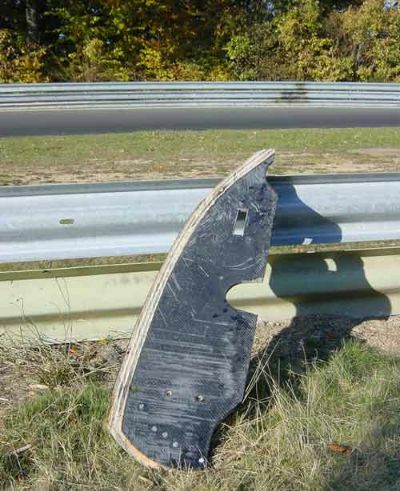 Part of a plywood and carbon undertray - perhaps a front spoiler - which we found in the undergrowth! Reverse shot looking back up at the entrance to Pflanzgarten. 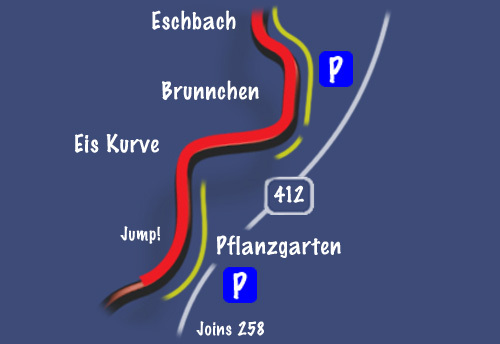 Reverse shot of Pflanzgarten, including the famous jump. Easy public access here from a large car park right on the main road to our right. Similar shot - but look at that sky! Bright sun here, brooding black cloud over the Adenau sections. 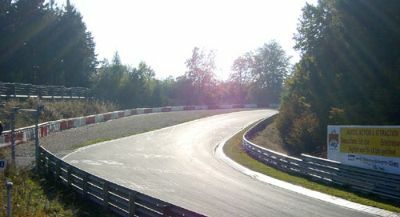 Track is easily big enough to experience all weathers in one lap. The jump can clearly be seen here, followed by a fast right hand sweep. 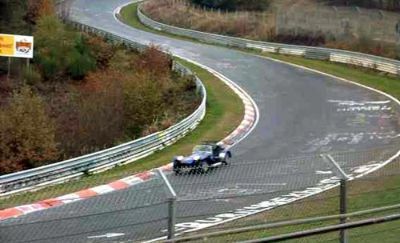 Various methods of taking this, but best is a dab on the brakes - if required - before the jump. Don't do it in the jump, as you will lock up the wheels as they go light over the crest! 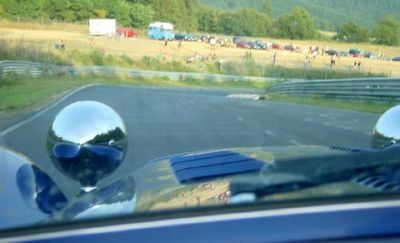 Drivers eye (or passengers eye in this case) view of the jump through Pflanzgarten. 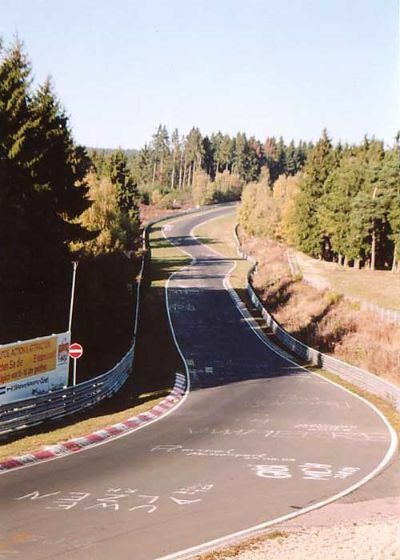 You get a proper rollercoaster feeling in your stomach as you go through here - its great! Reverse shot looking back up through the whole section. A little bit further round the corner. Again, one of the very few places on the lap with a gravel trap. Does not look very deep to me - you come down that hill pretty quickly - best to stay on the track I think! Picture above was taken from the fence visible on the left of this picture - another classic 'Suns rays on blind corner' picture! 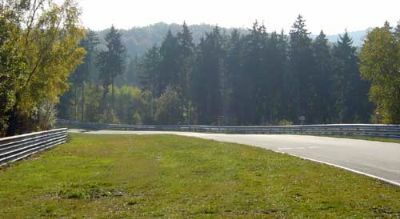 Looking back at the exit of Pflanzgarten. 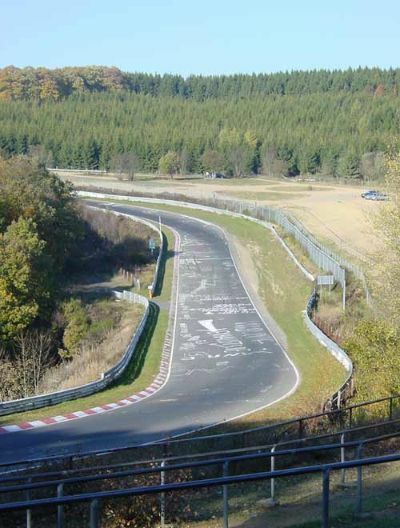 I think this is the following left hander with flows into what is known as Pflanzgarten 2 - again from the Mini boys. 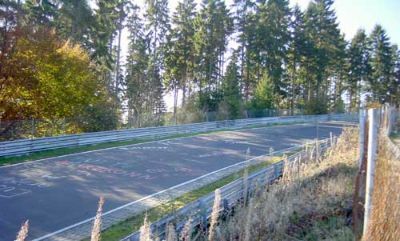 The corner above leads around to the left and over a crest into Pflanzgarten 2. 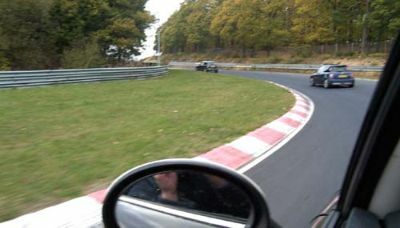 As confidence grew with more and more laps this became an almost flat out ride, swooping down over the crest - another great roller coaster feeling, as you will see from the pictures on the next page, and another favourite section of the Ring. Get it right and the feeling of linking corners together smoothly and flowing through them is so satisfying. 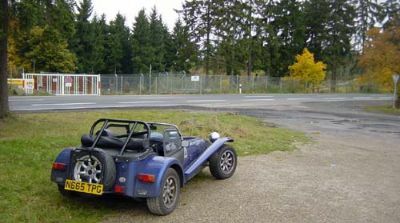 Car park opposite Pflanzgarten corner, just off the 412. Sounds obvious, but don't leave any valuables in the car as you wonder off to look at the track.